Pick Analysis: In his first year as a starter for the Bison in 2014, all Wentz did was throw for 3,111 yards and 25 touchdowns, leading the team to its fourth consecutive FCS Championship. What did the Bismarck, N.D. native do for an encore? Just come back from a broken right wrist that sidelined him for two months to lead NDSU in a fifth-straight title game victory. He started seven games in his senior year, completing 62.5 percent of his passes for 1,651 yards and 17 touchdowns (and four interceptions) while also running for six scores. Intelligence and work ethic are no issues for Wentz, who was named to the College Sports Information Directors Association All-American squad for the second-straight year. Published: April 29, 2016 at 06:38 p.m.
Ike and MJD interview Carson Wentz right after his selection and ask him what he needs to learn as an NFL quarterback. 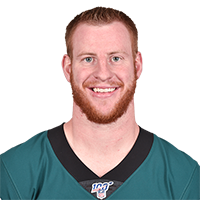 Published: April 29, 2016 at 12:10 a.m.
Philadelphia Eagles general manager discusses why Carson Wentz was the best fit. Published: April 5, 2016 at 05:30 p.m.
Take a look at the college highlights of North Dakota State quarterback Carson Wentz. Published: April 28, 2016 at 09:20 p.m. Published: April 26, 2016 at 06:28 p.m. The "Path to the Draft" crew breaks down game film of top NFL Draft prospects, Carson Wentz and Jared Goff. Published: March 25, 2016 at 04:58 p.m.
Take a quick look at some of the highlights from North Dakota State quarterback Carson Wentz. Will Eagles fans welcome Wentz? Published: April 28, 2016 at 08:34 p.m.
Dave Dameshek finds out if Eagles fans are excited about Carson Wentz as the franchise quarterback. Published: March 10, 2016 at 03:00 p.m.
Watch North Dakota State QB Carson Wentz work out at the 2016 NFL Scouting Combine.